Scaredy Cat, Yippie Puppy and Equestrian Friends . Animals are naturally "in tune" with their environment. They react to the behavior or emotional state of humans and animals in their proximity. They're also highly sensitive to tension and stress, which often leads to the animal presenting symptoms of undesirable behavior. 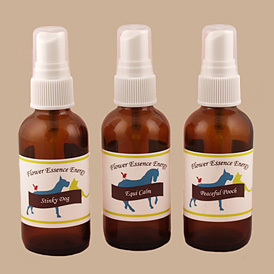 Flower Essence Energy Pet Tinctures and Sprays have been created to help animals deal with unpleasant emotional reactions, due to stress, anxiety, fear, nervousness or depression. 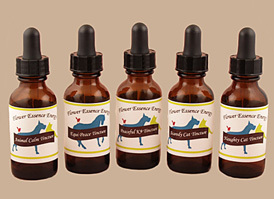 · Helps restore pets to a natural state of harmony. · Soothes the nervous system; inducing a calming effect. · Support a happier, healthier life. They are 100% Natural and Non-Toxic. Made from Distilled Water, Flower Essences and Pure Botanical Essential Oils. 2 oz. : Cover pet's eyes and mist lightly around head or body. 1 oz. : Place a few drops in water bowl daily. You can also place a few drops on paws, or behind the ears. Consistency is the key to helping modify a pet's behavior. Soothe their nervous emotions, help them calm down, and mellow out! They ll lead a happier, healthier life! Essential Oils are not used in Cat Products due to health considerations. Products contain water, glycerin, and flower essences. PEACEFUL POOCH Soothes hyperactive dogs, especially useful for puppies. EQUI-CALM Mellows your skittish equine friend. STINKY DOG 100% natural perfume. Perfect for the DOG who sleeps with you. Helps protect against fleas and ticks. Aroma: Geranium, Lavender, Lemon grass, Eucalyptus, and Ylang Ylang. NAUGHTY CAT (Tincture) Testy felines become part of the family. We have an eight year old greyhound / lab rescue. We got him at age 18 months and he has always been so hyperactive and hyper reactive that it was hard to know what to do with him. Recently he has been into non stop barking at the neighbors.I tried your Peaceful Puppy and Yippie Puppy and the change was immediate. He is much calmer now and when he barks we can get him back under control easily. I highly recommend these products. They worked when other flower essences did not.